Real casino players know this wonderful game. Baccarat is one of the most famous and traditional card games, that allows players to compete against other players and the house. Mini baccarat has almost the same rules but the game is played with less players. In normal baccarat each player is taking turns to be the dealer but in mini baccarat there is only one dealer. The aim of the game is to guess the best hand; own or the dealer’s. Therefore the player does not need to always have the best hand, but just to guess which one will be the best one. The player has to choose banco or punto meaning dealer or player. Placing the bets on certain areas gives the idea of which one you are choosing. 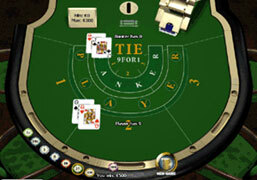 The player can also bet on tie, which still allows players to place their bet on either banco or punto. If played vicely, you can really win nice amounts in your pocket. Baccarat tables can normally be found in the high stake section of casinos but mini baccarat is traditionally placed on the casino floor. Online mini baccarat gives you the same opportunity to play with fewer players and earn extra cash. Baccarat: The name of this wonderful game meaning zero. The name of the worst hand of the game totaling to zero. Banco: Banker. One of the bets the player can select. Bankroll: The money the player is playing with and therefore bringing to the game. Burn card: The card that is removed from the deck after each deal. Callman: The dealer of the game who decides and runs the game. Coup: A French term for a round of Baccarat. Dealer: A person, who works for the casino and deals the cards in games, handles the bets and manages the table. Down card: The card that is placed face down. Hand: The cards that each player and dealer has. Hit: An expression used in card games when the player wants another card. Mini baccarat: A variation of the regular baccarat. Played with a smaller table and less players. Punto: Player. One of the bets the player can select. Stakes: The bets made by the players. Stand: An expression used in card games when the player does not want another card. Upcard: A card that is dealt face up.